When many of us hear the word lasagna, we think of the classic combination of ground beef, marinara sauce, layers of noodles, and lots of cheese. 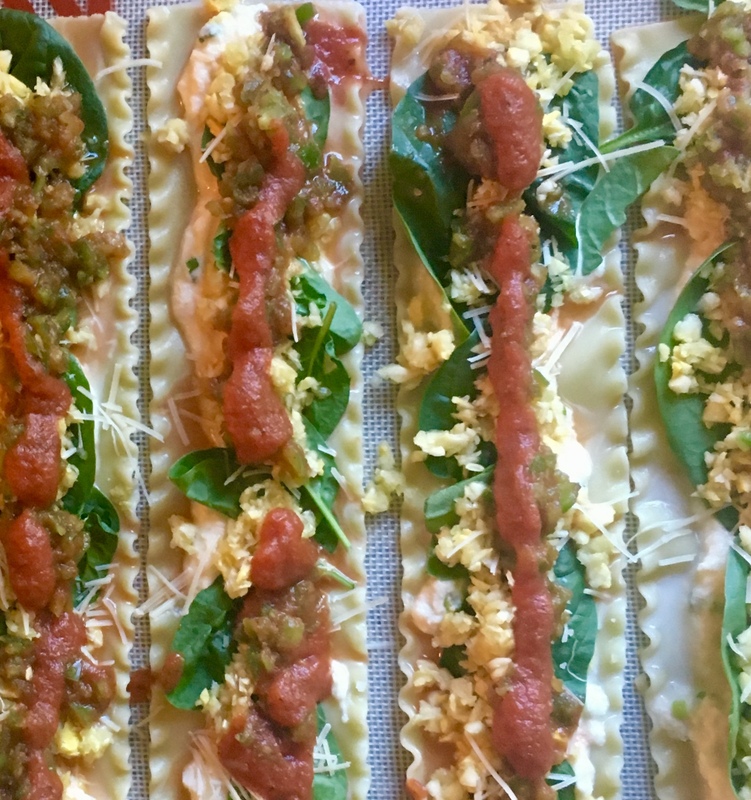 But this meatless summertime version, inspired by food touring in Rome and my love of garden goods, rejuvenates the beloved lasagna noodle with new surroundings. Why this fresh look at an Italian favorite? My family and I eat local produce if we don’t grow it ourselves, so I try to lighten our menus with more veggies. This modern twist on lasagna uses a helping of seasonal vegetables rolled into every serving. Each tender lasagna noodle surrounds a stuffing of delicate cheese and minced summer vegetables seasoned with a pinch of herbs. 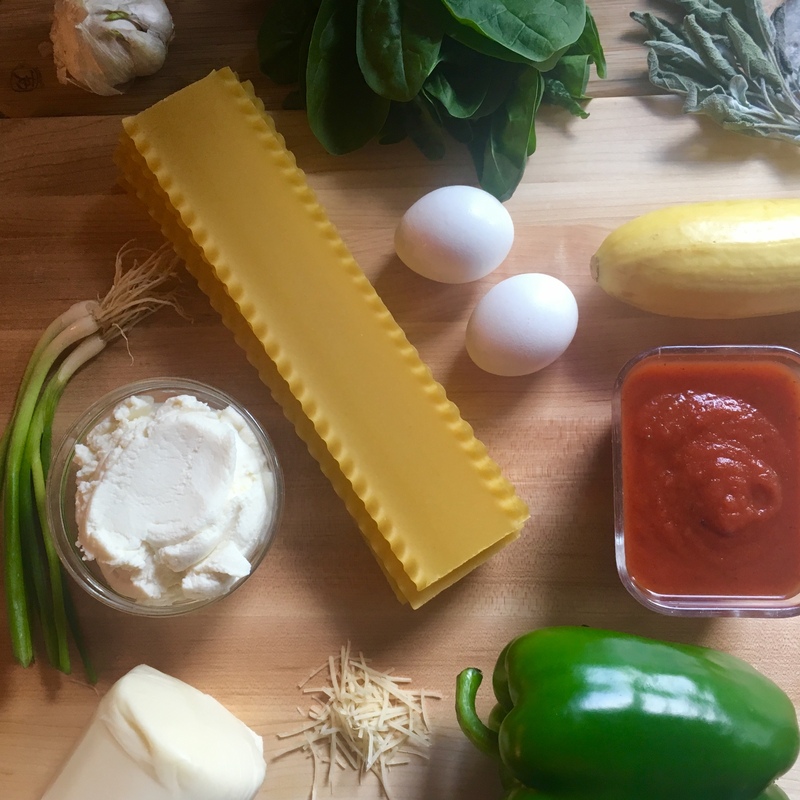 I mentioned that this recipe was inspired by food touring because my family was visiting Rome when I first became enamored with lasagna. I don’t mean the kind of lasagna we’re served in Italian restaurants in the United States. It wasn’t even my favorite lasagna recipe from Sunset’s Italian Cookbook! On every street corner in Rome I found a family owned restaurant, and of course, all the pasta sheets were handmade. What lay between the paper-thin lasagna sheets? Cheese, garlic and herbs. Yes, that’s right—no beefy Bolognese or marinara. Only delicate pasta with delicious white cheese. Heavenly! Don’t panic! 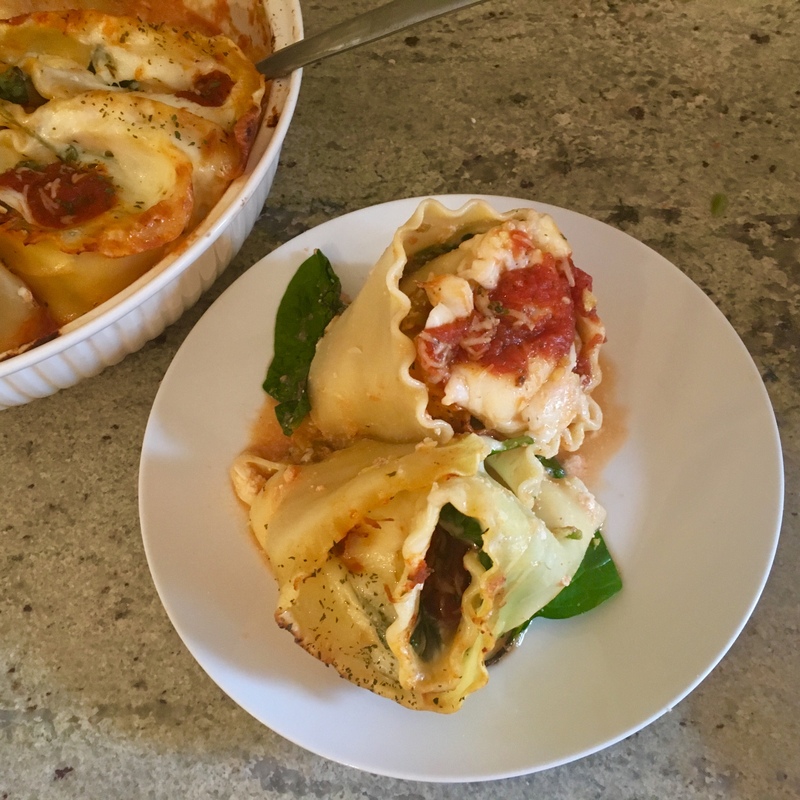 These rollups do not require handmade pasta, though I’ve made many a lasagna sheet in my day. (And you can find fresh lasagna pasta sheets in the refrigerator section of many grocery stores.) I find the rollups are easier to make with commercial dried pasta. To my delight, the taste of this lasagna is reminiscent of meatless lasagnas we had in Rome! Buon Appetito! Boil pasta in salted water, 12-15 minutes. Rinse until cool enough to handle, and lay flat on silicone or pastry mat. Mince green pepper and summer squash and combine, or pulse in food processor until finely chopped, careful not to purée vegetables. Drain off any excess liquid. In a medium bowl, stir together ricotta cheese, egg, sliced green onion (white bulbs and green tops), Parmesan, salt, and herb seasoning until evenly combined. 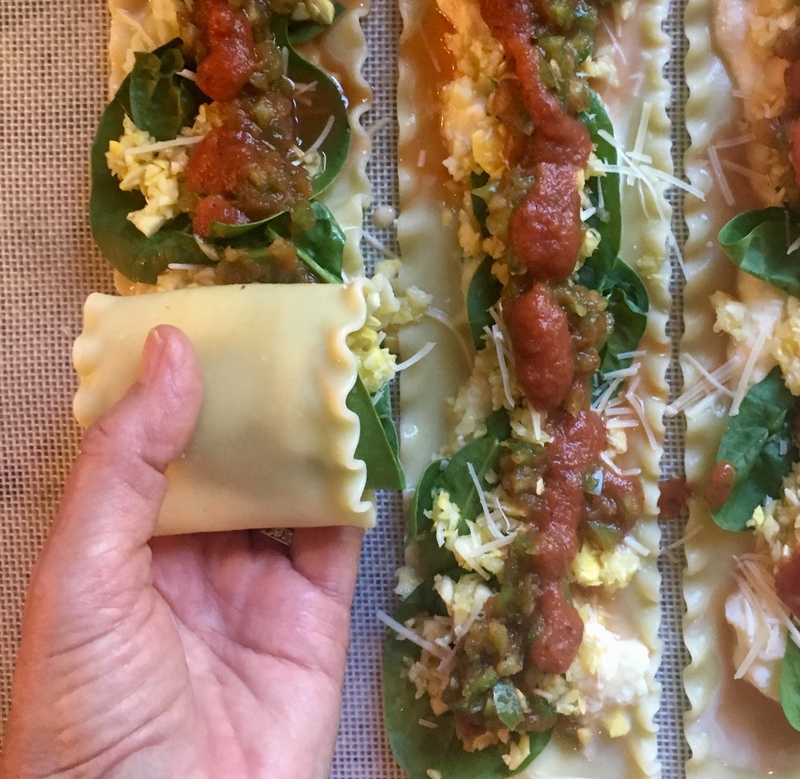 My method for making the rollups is to space the cooled lasagna noodles out on a large silicone mat to work with them easily. 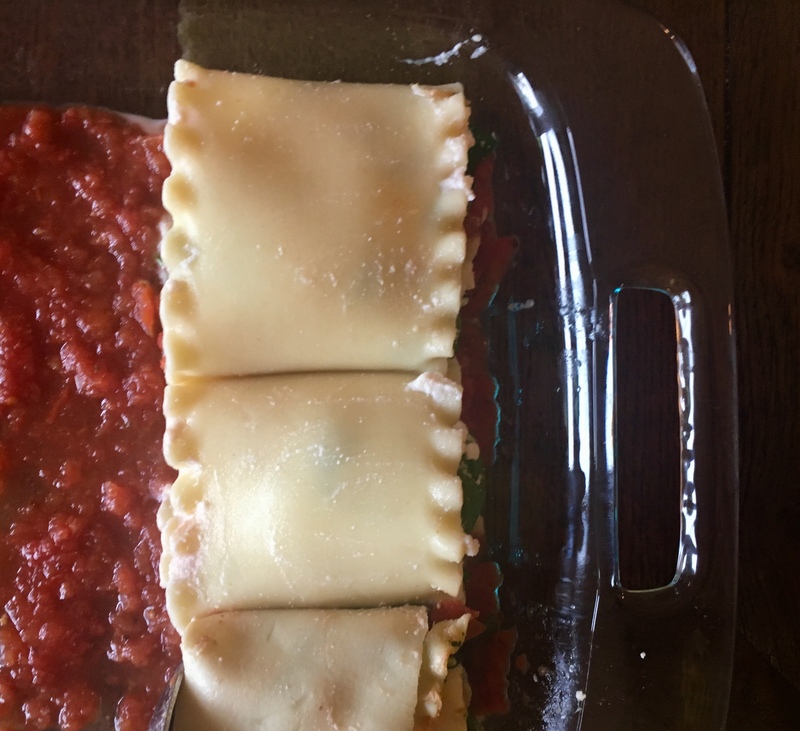 Use a spatula or spoon to portion out and spread the ricotta cheese down the middle of each noodle, followed by a layer of baby spinach leaves. Top the spinach layer lightly with one tablespoon of the grated Parmesan cheese, a pinch at a time. Using a spoon, portion out the layer of the shredded vegetables. Then use a liquid measuring cup to pour a line of sauce down the very center of each noodle. 7. Finally, roll up each noodle, cradling the rollups in both hands as you place them one at a time into the baking dish, seam side down. Using a 9 x 13 casserole, place the rolls three across and four down. 8. Once you get all the rollups in the casserole dish, having straightened them up as you go, use a spoon to replace any of the filling that may have sneaked out. Place one slice of mozzarella on top of each rollup in the baking dish. Sprinkle with remaining Parmesan and top each rollup with a dot of sauce. The dot of sauce is how you know where each rollup is when serving. Bake in a 350-degree oven for 40 minutes.